Roll out those lazy, hazy, crazy days of summer. Days of Juicy Juice, Goldfish and Mom’s yummy home-made monster cookies. Dust off the sun and the moon and sing a song of cheer. Fill your lunch boxs full of your favorite summer goodies. Lock up the house, load up the SUV and buckle up and lets Go, Go, Go on an adventure at the seashore. 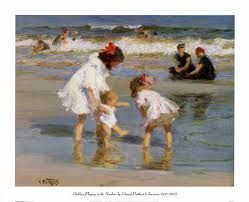 Roll out those lazy, hazy, crazy days of summer when boys and girls are happy day dreaming about swimming at the seashore, listening to the ocean in seashells and drawing funny faces in the sand. They are hoping that they will win first place for building the tallest sand castle. Roll out those lazy, hazy, crazy days of summer as the clumsy toddlers with their legs sprawled out for balance and a shovel gripped awkwardly in a little fist as they are intent on filling a bucket full of sand and sea shells and are fully unaware of their mothers loving gaze. Dust of the sun and the moon and sing a song of cheer and roll out those lazy, hazy, crazy days of summer.